The Library’s Integrated Information System, online August 16, 2010. This is IEEE’s Millennium product. 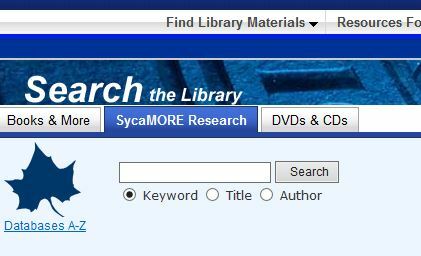 SycaMORE Research is a new customized searching experience that allows you to search most of the library’s electronic resources, including its catalog, simultaneously. 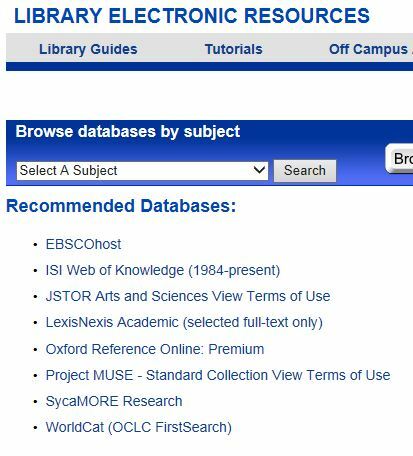 SycaMORE Research provides full text access to many of these resources, ranks your search results by relevancy, and includes availability information for items in the library catalog. The system upgrade mostly affects the invisible, technical side of our library but some might find it interesting, hence posting to the blog! We have fully moved over to the Sierra platform. Encore and WebPac (internally branded as Fusion) seem to be operating properly. We will be circulating using Sierra from now on. ISU Systems and Technical Services are running through check lists as is VCPL. The checklists help us identify bugs to report to innovative. This is a preliminary all clear to start using Sierra. Once all the checklists have been verified and user access levels have been confirmed we will send out a final all clear. Thank you for your patience today. On Wednesday (07/10/13) Cunningham Memorial Library will be upgrading its online catalog. The Fusion and Encore databases will not be accessible during the upgrade period, which hopefully will not take more than one day. This outage does not include direct access to subject databases and ebooks provided by the library. Within the library, the library computers, Internet and printing will be functional all day. Physical circulation will also be available but limited during the day. However, patrons must provide a valid ISU ID or resident card to check out materials. The Library will not circulate browsing media items. This includes movies, music, video games and audio books. The library will be unable to renew items, create new patron accounts or edit existing patron accounts during this time period. 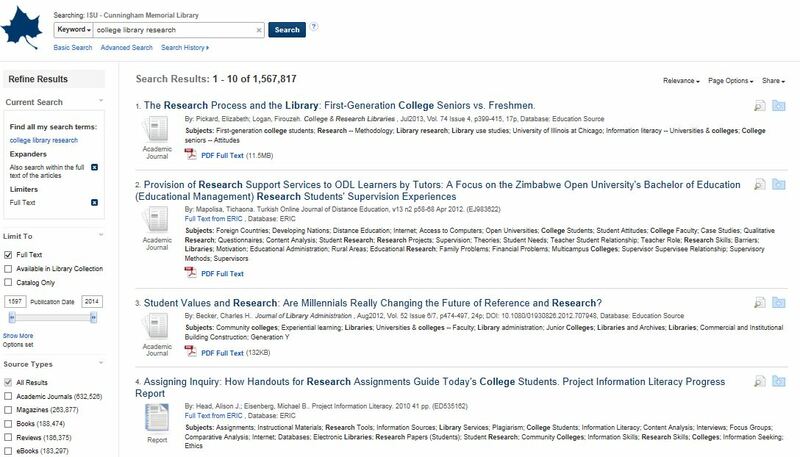 1) Academic OneFile, a multi-disciplinary database provided by Gale that indexes more than 14,000 titles and includes full text for more than 6,000 titles. a) A link to this paid resource is now available on the main database Web page. Direct link for ISU users. b) Links to full text titles will be visible starting tomorrow through the Electronic Resources homepage (E-Journal Portal) and through Fusion/Fusion Plus in the future. a) Links to 7 Open Access electronic journals will be visible starting tomorrow through the Electronic Resources homepage (E-Journal Portal) and through Fusion/Fusion Plus in the future. 3) BASE (Bielefeld Academic Search Engine) is now available on the main database Web page. DIRECT LINK. This interdisciplinary search engine provides access to more than 30 million documents from 2,000 plus sources. Links to full text are available for around 75% of indexed content. BASE is a registered OAI service provider, a contributor to the Digital Repository Infrastructure Vision for European Research project (DRIVER), and is maintained by the Bielefeld University Library in Germany (Universitätsbibliothek Bielefeld). Users can search BASE in English, German, Polish, and Spanish, but help and other advanced features are only available in English and German. The 9th Annual Extravaganza, Thursday, September 15, 10am – 3pm is getting closer! Here is a list of participants – ISU students will need 10 stamps on their prize cards before they can turn them in. Sometime last Monday, Content Cafe was turned on. We are testing this enhanced content for 1 year. Book jackets should be associated with print books as well as electronic books, CDs, and DVDs. Full Text review sources include Publishers Weekly, Library Journal, School Library Journal, and Booklist. hey! do you want to know ‘what’s new’ in the 4 libraries that make up the Library Consortium of the Wabash Valley – ISU, Rose-Hulman, St. Mary-of-the-Woods, and Vigo County Public Library! Fusion and FusionPlus have arrived! New webpac! New options! Ok everyone who has been at Indiana State University since 1985: THERE IS NO MORE LUIS! Yes, through several opacs, we have been luis.indstate.edu for 25 years! That’s going to be a hard one to shake – attention, faculty: be sure to take out of your Syllabus/assignments all mention of LUIS. Now, it’s FUSION! Three universities and one public library in one webpac! Or http://fusion.indstate.edu for a simple search box – you can still get to FusionPlus if you need it! Same address: http://library.indstate.edu but a whole new look! Introduced this morning, along with our new http://fusion.indstate.edu and http://fusionplus.indstate.edu integrated library system, we’ve re-packaged the site for the first time in several years. Be sure to take a look. let us know if you have questions about any aspects of the new homepage or fusion/fusionplus. like all updates this major, there will be continued tweaking over the coming weeks.